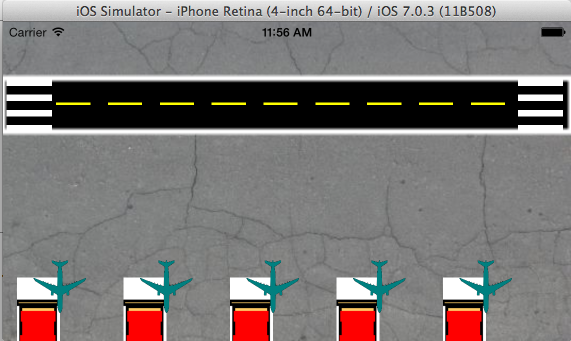 I am building an airport simulation game using sprite kit. My layout for the game states intact before adding SKPhysics body and once SKPhysicsbody is set for nodes, my sprite nodes goes wary. This is what I am adding to scene without SKPhysicsBody. Imagine a airport with many gates and flights standing next to the gates. That is what I am trying to achieve with below code. Till now everything looks fine.Please see attached image called scene1 to see what I see with above code. only one plane sprite is seen in my scene now and I am not able to figure out why? I also converted the code to use dot notation, I find this easier to type and read. Not the answer you're looking for? Browse other questions tagged sprite-kit skphysicsbody or ask your own question. How to add SKSpriteNode from a method into another class? How to create multiple node characters in sprite kit /SKphysics joint?